You know gentrification is nestling quite comfortably in your neighborhood when you see a portable grill on the sidewalk selling $8 bacon wrapped sausages by a twenty-something-year-old millennial in a rustic-stained welding apron. In truth, bacon wrapped hot dogs are a common delicacy sold by immigrants, or lower income folks during the darkness of the night, and normally costing $3 a piece. Not only is the inflation of the price a robbery, but also an assault to the underground economy of local vendors. It is a stab to the heart of any vendor that has been humiliated and harassed by authorities and ordered to pack their goods and go. I am a millennial, a Santa Ana resident and a photographer. I have photographed and befriended street vendors in downtown Santa Ana and taco truck vendors for five years. I’ve heard their stories, and witnessed how their businesses are now at risk. When I was just a kid, downtown Santa Ana was an area filled with Mexican restaurants and vendors of all sorts. You could easily find, produce, piñatas, dulces, or even a sobadora ready to help anyone that couldn’t afford traditional U.S. healthcare. Maria, a food vendor I interviewed 3 years ago, was on the verge of tears when she explained to me that her job in the downtown area consisted of bringing home-cooked meals to the business owners who couldn’t afford to close their businesses for lunch. As more of her clientele got pushed out (Quinceñera shops, photo and film, and insurance places just to name a few) her livelihood was also threatened. The concentration of restaurants is one thing, but to see high-end restaurants dominate space that is not available to other street vendors is Privilege at its finest. Strict and prohibitive regulations set forth by the city of Santa Ana, and the rising costs of owning a business in an overpriced downtown, have contributed to the loss of our community’s financial security and economic power. This is why the impromptu hot dog stand set up by a popular new restaurant, Vacation Bar, struck a chord with me. I was very indifferent about their arrival in downtown Santa Ana and found it to be just another trendy addition to the changing downtown. When I was scrolling through my Instagram that night and saw Vacation Bar advertising and selling their street hotdogs on the sidewalk it highlighted a multitude of injustices. 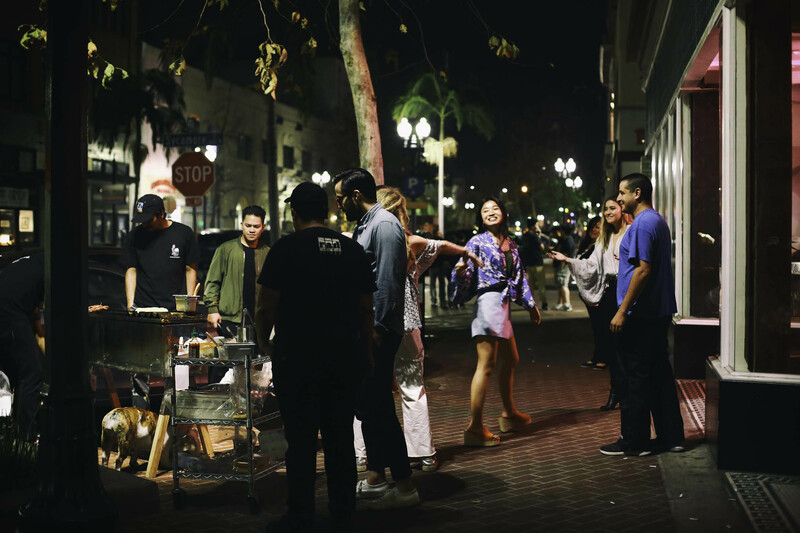 These restaurant owners had taken an idea and stapled it to the front of their doorstep, and presented it to passerby’s on the busiest night of the month in downtown Santa Ana: The Art Walk. This business model was very common for many local vendors before Vacation Bar. It made me question Vacation Bar’s awareness of their immediate surroundings, how they could possibly seek to profit from an activity that was otherwise prohibited to a community of local vendors that were turned away for doing precisely that: vending comfort food in their community. The cart in front of Vacation Bar had no visible certification, and still the security guard did nothing to reprimand the vendor. I then flagged down a police officer and asked him the same question. “Well, I don’t like to push them out, but there are very specific rules down here in Downtown Santa Ana, so strict that even daytime vendors have to wear a uniform provided by downtown” explained the officer. One thing was clear right away: authority figures are picking and choosing what vendors can capitalize on a sidewalk to patrons. In this case, the cart lacked a visible permit and the vendor was not wearing a visible uniform. These arbitrary rules only got me to think: Who decides who can capitalize on sidewalk sales to patrons during art walk? Could this be an opportunity for local vendors to earn more for themselves and their families? A woman who sells bacon wrapped hot dogs for $3 can make up to $100 on a good night. The average price for a cocktail at Vacation Bar is $12, and an appetizer is $15. The bacon wrapped hot dogs outside of the bar were on sale for $8. The inflation of a bacon wrapped hotdog can definitely have an economic impact, especially when you pair it up with rising costs of properties. This is a disturbing national trend, “When Gentrification Isn’t About Housing” details the fetishization of what I consider “hood food” and how it is essentially stolen and repackaged by more affluent communities while the original owners suffer economic injustices and harassment. Lack of resources ultimately disables the originators to comply with city code regulations or gain the economic power to open an actual establishment. 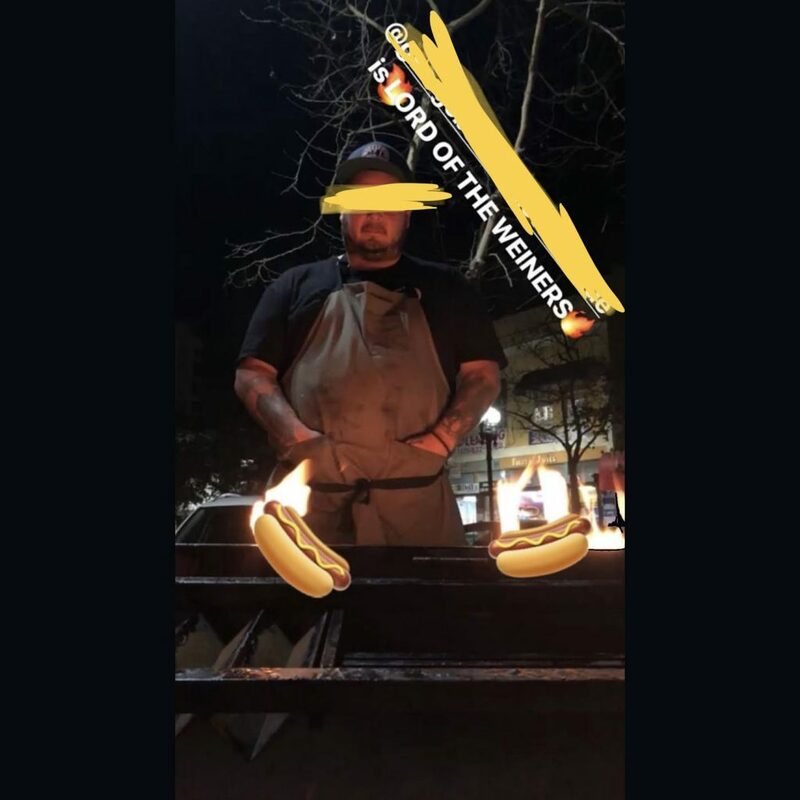 A high-end restaurant appropriating a bacon-wrapped hotdog and selling it for nearly triple the price on the same public sidewalk from which street vendors have been pushed out due to that very restaurant opening in the first place is a perfect illustration of gentrification. This scene opens the doors to many conversations. It is with this observation that I hope to encourage all of us take the time to understand how our choices in which businesses we frequent can harm those who do not have the privilege to be ignored by code enforcement and security guards. I ask us to recognize that street vending is a tenuous means of survival for many, not just a once a month marketing gimmick. It has been the means of survival for many generations of Latinx immigrant communities. And for businesses like Vacation Bar: don’t set up shop where you are visibly challenging and disabling the local vendors any further than you already have. is a Mexican-American photographer from Santa Ana, CA. She is the oldest of seven children and daughter of two Mexican immigrant parents. 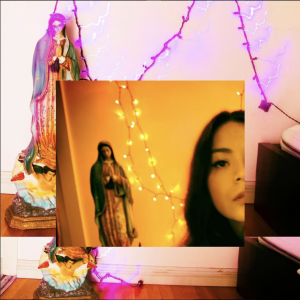 Her photography is a physical manifestation of tangible truths and a homage to her subject matter. Whether she is traveling or walking the sidewalks of her hometown, she enjoys fusing elements of portraiture in her street photography.